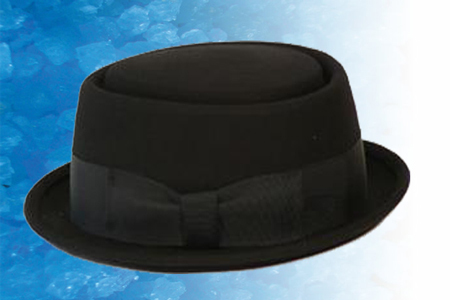 The suave stylish Heisenberg Hat is the head wear made famous by Breaking Bad character Walter White / Heisenberg. This is a 100% wool felt, 1-5/8″ brim and 1-1/2″ ribbon band. Stingy Brim Pork Pie Hat! (Not a costume hat) Patrons come in everyday and from all across the world to pose as Heisenberg in our shop. Get yours today! !